The weather drew me to this location, where I could be on the western edge of the storm at sunset, ready to shoot whatever interesting light developed on the clouds and rain. The main exposure for this image was 0.3 second at f/16, ISO 200, 70 mm focal length. Three exposures captured one stop apart were adjusted in Adobe Lightroom, then combined in PhotomatixPro 6. Sometimes less in more in landscape photography. 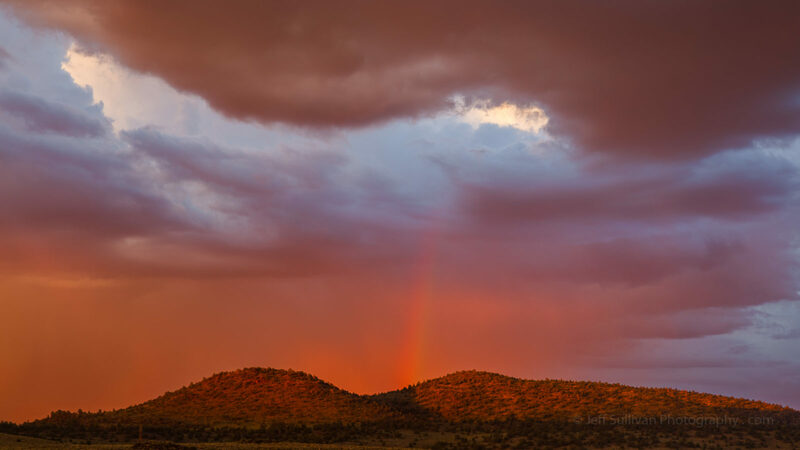 The warm sunset light creating this rainbow was stunning, and the clouds echoing the general shape of the hills below encouraged me to select this composition for the scene. Rainbows are from light reflecting back out at your from within rain drops, and they're 42 degrees off axis from the sunlight, so you have to be on the same side of the storm as the sun to get them.